The uproar over the use of what are generically known as "PEDs" (performance-enhancing drugs) has become so clamorous that it is drowning out those few sources seeking to convey the facts about these matters. Great numbers of assertions that are dubious or demonstrably wrong are being parroted by a seemingly endless parade of individuals and entities all of whom have manifestly done no actual research into the matters on which they so loudly, and usually savagely, declaim. This situation has been sorely exacerbated by the release of the so-called "Mitchell Report", in which most of those dubious and false assertions have been embalmed as they were self-evident axioms. The purpose of these pages is to methodically dissect those claims and assumptions and compare each with what is actually known about it. To begin, we must ask the basic question: who cares, and why? What, in other words, is meaningless about a player eating Wheaties but is objectionable about his taking a PED? To answer that "taking PEDs is wrong because they are illegal and banned" is to--in the correct sense of the phrase --beg the question. We want to know just why PEDs should, or should not, be considered objectionable. Most or all PEDs constitute a grave health risk to those taking them. Publicized use of PEDs by famous athletes leads children to use those substances. PEDs materially augment players' abilities, and so corrupt achievement records. Use of PEDs by some effectively coerces others into using them to remain competitive. The first thing we should notice is that those reasons are heavily entangled. For example, the significance of Number 2 relies on the truth of Number 1, as the significance of Number 4 relies on the perceived truth of Number 3. Nonetheless, we will address them individually--but we should keep those entanglements in mind as we do. Because these pages delve into their topics at great length, they would make hard reading if I were merely to follow the Red King's famous advice to Alice. Thus, this page discusses those four claims in a relatively short summary form (relatively, remember); then, in the summation for each claim is a link to a much longer stand-alone page examining that particular claim and the evidences for and against in detail, including the sources validating the statements made. In sum, what is on this page are the results of the analyses, not the analyses themselves. I want to emphasize that point--that this page is only a summary--because a reader who wants to take issue with what is said here, if he or she is to do so with intellectual honesty, must refer to the detail pages and must meet the full analyses and references appearing there with his or her own persuasive arguments and supporting citations. To do anything else is merely to handwave (and handwaving is what almost all of the public "discussion" of these matters has so far entailed). I am painfully aware from long experience that no matter what I say and urge here, the many season ticket holders to Short Attention-Span Theater just will not go beyond this page, and will go away thinking they have "read about" what this site is presenting. But I can only do what I can do. The list above is the order in which George Mitchell presented the issues, but it is not a logical order in which to consider them. I will begin by examining the generally ignored threshold question, #3 above, which is whether PEDs in fact even have a material effect on baseball results. The broad term "performance-enhancing drugs" comprises two classes: those that improve strength and those that fight fatigue and improve alertness. The first class includes all the substances currently the focus of public attention, especially steroids and human-growth hormone; the second notably includes "greenies"--amphetamines--a serious drug of long-standing abuse whose significance has been largely ignored in the current furor. Though there is a brief discussion of stimulant substances on the detailed medical-effects page of this site, from here on references to "PEDs" will mean the strengthening PEDs. To successfully measure power per se, what we need to do is relate well-powered balls to hit totals. We could use the ratio of home runs to hits, and that works pretty well. But not all "well-powered" balls necessarily leave the yard: doubles and triples are also, to some extent, indicators of power. Thus, the best measure of sheer power is Total Bases per Hit, a figure aptly known as the Power Factor. I must assume that anyone reading this knows what the stat Total Bases is. 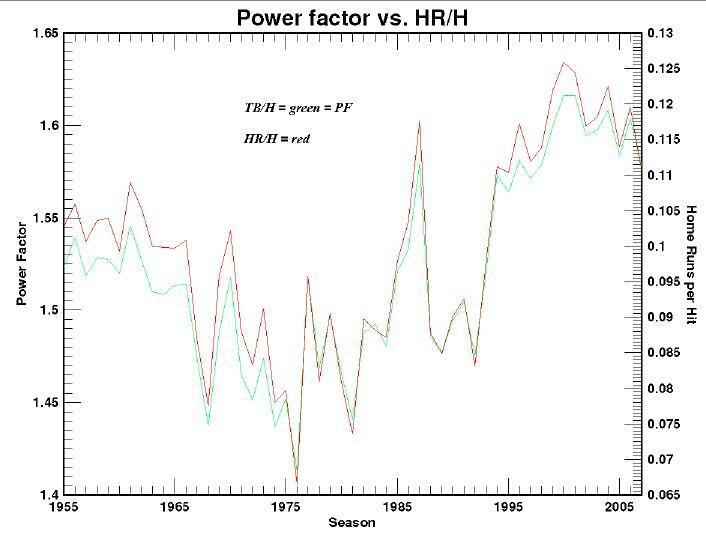 In sum, if we are looking for PED effects on baseball's records, we must examine PF (Power Factor) data; moreover, if we are looking for systemic indicators, we need to be examining the all-MLB PF over some sufficiently long period of time. The claim that there has been a gradually increasing use of PEDs by major-league ballplayers over the past quarter-century or so (that is, from very roughly 1980 on, which period is about what the Mitchell Report claims), and that that use has affected performance results, necessarily translates to a claim that all-MLB PF numbers will show a matching sort of increase over that period. The extent of any such increase is a fairly exact measure of the extent to which PEDs can be said to have influenced performance results, provided we consider and examine any other extrinsic factors that might affect power results. There are many ways to seek PED effects on performance. I know of at least seven different analyses, each using a different methodology; two of those I have done myself, and we will now look at those two; the rest are cited in the detail page of this site that goes into the purported effects of PEDs on performance, and which is linked at the end of the summary presentation here of the "tainted records" claim. This approach has the advantage that it is quite visual, so that even the least mathematically inclined can literally see the points being made. 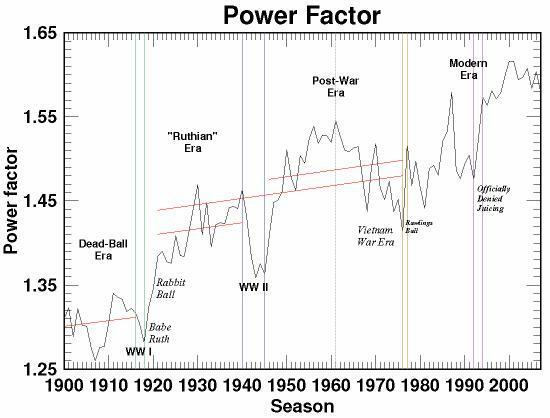 We examine by the simple method of graphing historical Power Factors. Here is a raw PF graph of all of major-league baseball for the entire "modern" (post-1800s) era, from 1900 through 2007 inclusive. The main page on this topic has a much larger image of the graph, but this reduced version is in a way even more useful, in that long-term trends are more obvious. Let's begin with a quick tour through the seasons to see what it shows. Two things quickly become obvious: one, that for most of the century there appears to be a fairly steady upward trend to power; but two, that at certain points there are sudden discontinuous jumps. (That is even ignoring the expected dips and jumps that represent the starts and ends of WW I and WW II, which are labelled on the graph.) Those discontinuities separate readily recognized distinct eras in the game. The slightly upslope red lines represent the long-term averages of the years that they span, smoothing out the minor year-to-year zigs and zags. Those discontinuities are extremely important to an understanding of power results, so let's look more closely at them. The very first discontinuity (not annotated on the graph) is 1910/1911--a relatively modest one by later standards--which marks the introduction of the cork-center baseball. The next of the discontinuities, and perhaps the most famous, is the advent in 1921 of the so-called "rabbit ball", a ball juicing that resulted from the immense popularity of the emerging hero, Babe Ruth: the Babe's homers made the turnstiles rotate, so what was good for the Babe was made good for everyone. 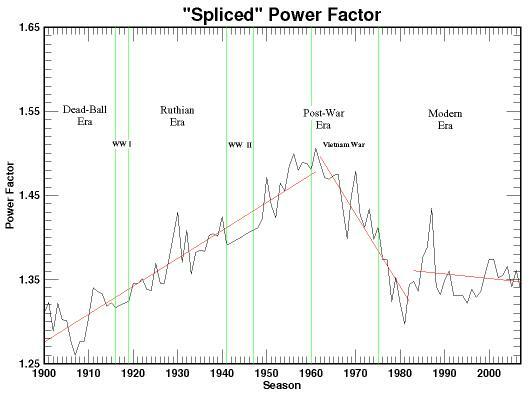 After that, one can see clearly--if the anomaly for WW II is mentally smoothed out--that the rise in power production during the four decades from 1921 to 1961 was remarkably steady. The last discontinuity is the ball juicing of 1993 - 1994, which apparently ensued from a change made then in the ball-manufacturing process (it looks as if the change introduced the new ball roughly mid-1993). Subsequent to that jump, the trend looks like a continuation of the gradual upward movement. MLB has steadfastly denied all of those ball juicings, no matter their obviousness or the actual events (manufacturing processes, for example) associated with them. Mind, except for (probably) the original rabbit ball, it may well be that the jumps were unplanned--incidental effects of innovations in the manufacturing process. But to deny that they did happen, when they happened, and that they were definite, discrete events requires a massive dedication to belief in the Tooth Fairy. Because the ball-juicing discontinuities are critical, we can and should look further into the evidences for them. Of course, the very first consideration is that they are exactly what we are calling them: discontinuities. They are not increases, even rapid increases: they are each a sudden large jump from one season to another, with both the pre-jump seasons and the post-jump seasons being clearly continuous eras separated by an overnight (or, in fact, over-winter) abyss. No theory that relies on any gradual process, even a pretty fast-acting one, can possibly explain the "step" nature of those power jumps. That includes expansion. Three of the four discontinuities predate any expansion, with the 1977 one exactly corresponding to a known event, the substitution of Rawlings for Spalding as the supplier. Moreover, the data show that expansions have had pretty much no effect on scoring or power, which makes sense: any hypothesized "dilution"--which in any event ignores the much-expanded population pool from which to draw baseball talent--would have to be essentially equally distributed between batting and pitching, thus zeroing out any net. It also includes new or altered ballparks. Of the two that came on line in 1993, one (Mile High) was very good for power, but the other (Joe Robbie) was a major power reducer. But we don't have to rely on the obviousness of the results data, because there have been actual examinations of modern balls by scientists in laboratories. For example, a 2000 examination at the University of Rhode Island, on which a team of six professors spent five months, found that ball cores from 1995 and 2000 balls bounced an average of 33 percent higher than their 1989, 1970, and 1963 counterparts. And in 1998, a CT scan of baseballs from many eras, supervised by Penn State professors, showed serious differences over time in materials and internal construction; in fact, Mark McGwire's record-setting 70th home-run ball (like others from that season) clearly showed a synthetic rubber ring or spring around the core of the ball. Those results are much more meaningful than the fatuous puff piece MLB sponsored in 2000 as a PR exercise. Because the definite existence of these ball changes is so important, there is a whole separate page on this site that greatly elaborates these careful scientific researches into the changing baseball. But between the obviousness of the records and the supporting results from the scientific examinations of actual balls, there can be little realistic doubt of the juicings, however unintended they may (or may not) have been. 1. The artificial "valleys" of WW I and WW II were smoothed out by replacing the data for 1917 - 1918 and for 1942 - 1946 with an even transition between the data points for 1916 and 1919, and 1941 and 1947, respectively; that seems unexceptionable. No effort was made to compensate for any Vietnam-era effects, though they may play a major role in the decline through that period. 2. The discontinuous jumps were subtracted out as they occurred. That is, the size of difference between, for example, 1920 and 1921 was subtracted from all years from 1921 on; the gap between 1976 and 1977 was further subtracted from all years from 1977 on; and the gap from 1992 to 1994 was yet further subtracted from all years from 1994 on (1993 was then set at a value between 1992 and 1994). This does hide whatever actual zigs or zags there may have been for the three discontinuity years--that is, what annual changes there may have been not attributable to changes in the ball--but, as can be seen, such annual zig-zags are normally small. The point of noting the discontinuities is that they are extrinsic factors--that is, they are completely unrelated to player performance. Batters hitting the same as ever showed more power after each discontinuity not because those batters magically became more powerful over that winter but because they were hitting a "springier" baseball that would travel materially farther for a given force applied by a batter. The rate of decline from 1962 on through 1981 was dramatic; we don't need here to speculate on causes, because that's not relevant to our investigation. From 1982 on through the present, power has been nearly flat (it looks like a slight downtrend only because the bizarre 1986/1987 spike "front-loads" the average, but I didn't want to arbitrarily smooth out those years). It thus becomes quite impossible to believe in any theory that speaks of "boosting" power in modern times, simply because there has been no such boost. 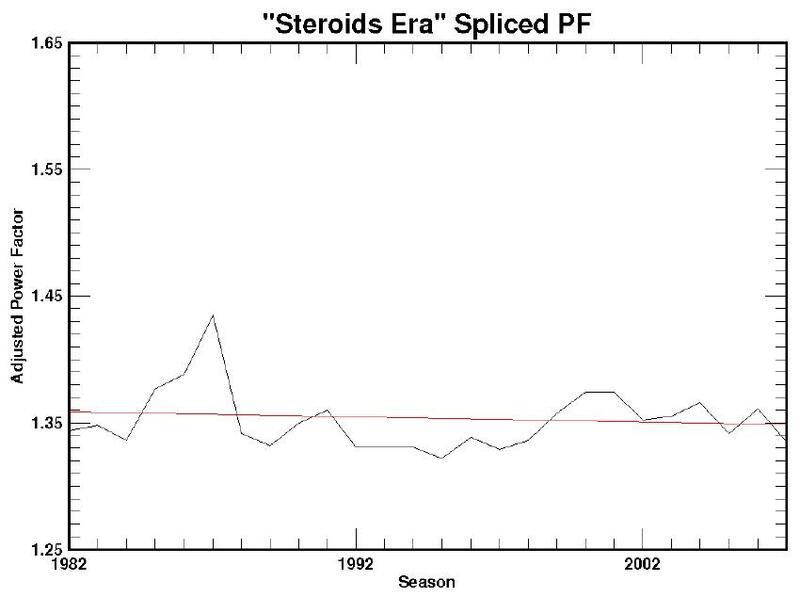 Below is a blow-up graph of the so-called "steroid era", starting at 1982 (because 1981 was strike-shortened and thus not a good data point). Understand that nothing in this graph has been adjusted save the single ball juicing of 1993/1994 (whether 1993 was or was not post-juicing is still debated); the numbers on the left would change were earlier splicings and wartime smoothings dropped, but the shape and scale of the graph would be unchanged. Can anyone look at that graph and see some "power jump" somewhere?!? Remember, nothing is alleged to--or can have--happened to all of MLB over some one or two seasons: the claim is that PEDs were being used at a slowly but steadily increasing rate (and thus "distorting records") from very roughly 1980 through the present. Were that so, or anything like it, we would expect to see a clear long-term uptrend during this period. But we don't: we see a nearly flat line that, if anything, slopes slightly down. The "boost" just isn't there. But that doesn't seem to stop anyone from talking about it. Now let's take a totally different approach to looking for what steroids might do for power. This time, we'll rely on physics and equations. There are well-established formulas, grounded in basic physics, for calculating the speed with which a batted ball leaves the bat on its journey fenceward, which (excepting minor wind effects) is all that matters to distance for any given upward angle. Such formulae can be found in numerous places, such as Professor Robert Adair's well-known book The Physics of Baseball, as well as various technical papers published by other physicists. Even though the equations are not--as such things go--terribly complex (simple algebra, no calculus), I have kept discussion of them and their use to the full background page here on Actual Baseball Effects of PEDs, which everyone reading this ought also to read in general, but here in particular so that what is said below does not appear to be black magic but rather straightforward science. On this page, we will just look at a simple but critical matter, then see the results. As it turns out, the distance a batted ball will travel at a given upward angle depends solely on the speed with which it leaves the bat. That, in turn, depends on a few things, from the velocity of the incoming pitch to the bat weight, but the one we are interested in is the speed of the bat at the moment of impact: that is the sole ball-distance factor having to do with the batter's strength. We can analyze muscle effect by assuming a reasonable value for bat speed based on a representative 200-pound batter (which will be 67 mph), and then calculating the distance he would drive the ball if he clips it dead on and sends it up at the optimum travel angle (about 35°). That comes to roughly 440 feet--but we aren't really interested in an exact figure from our assumptions: what we will want to find is the variations from that figure that would result from changes in the batter's muscle mass, which we measure as presumptive added muscle weight, to see how much extra distance a given amount of added muscle adds to the flight of the ball. Now here's that critical matter: in doing this, we have to be very, very careful not to make the elementary mistake that some--from sportswriter to physicist--have made in trying to simplistically plug numbers into Professor Adair's equations. That mistake is to assume that all added muscle mass is being used to further power a struck baseball. It's wrong. The considerable energy . . . transferred to the bat . . . is generated largely by the large muscles of the thighs and torso. The arms and hands serve mainly to transfer the energy of the body's rotational and transverse motions to the bat and add little extra energy to the bat. [Footnoted with:] In particular, the contribution of the hands and wrists to the energy of the bat is almost negligible. In short: Batting power is all about lower-body strength. Bulging biceps and triceps and deltoids and the rest of the upper-body muscle set may wow the baseball Annies--and perhaps scandal-sniffing reporters--but they mean essentially nothing to long-ball hitting. We don't need to rely on physicists for that fact: anyone in baseball knows it well. That is, the approximation deals with situations like that illustrated here, where the two men being compared with the equations are assumed to be perfectly proportional to one another, just different in size (and hence mass). But when instead we are dealing with two different versions of the same man, one before and one after adding muscle, we cannot assume--because it won't be true--that the two versions will be exactly proportional. We can no longer assume that the significant (lower-body) muscle mass increases in proportion to overall muscle-mass gain, because the gain is differential. Steroids have a markedly greater effect on upper-body strength than on lower-body strength. Batting is almost exclusively powered by lower-body strength. Beefcake doesn't drive long balls. For this thought experiment, I used ratios of both 4:1 and a more moderate 3:1 upper/lower differential. I'll take the example of that 200-pound man who adds 20 extra pounds of pure muscle, a pretty substantial gain (and almost identical to that attributed to Barry Bonds). Skipping over the arithmetic, if the upper/lower ration is 4:1, he'll be able to drive the ball an extra 30 inches or so; if it's 3:1, that would go up to maybe 45 inches. Right away, we see that that's not much. And remember, too, that we have assigned all of his muscle gain to steroids, which is just silly: if he went through the same exercise regime without any steroids, he'd still gain some significant muscle. Just what does 2 to 4 extra feet mean? It's hard to say, but (and the line of thought is on the longer page) that kind of difference--that is, without the extra muscle the ball falls 2 to 4 feet short but with it it just clears the fence--might mean one extra home run a year for an average man; and, again, the purely steroidal component might not even mean that. So it's not at all surprising that the actual stats of the game show no effect from putative steroid use, bulked-up biceps or no. There is no evidence that steroid use has altered home-run hitting and those who argue otherwise are profoundly ignorant of the statistics of home runs, the physics of baseball, and of the physiological effects of steroids. Contrary to what uncountable numbers of ignoramuses are chattering away about, medical science has long been aware that strength tends to peak at about age 40 (or possibly later), and then typically remain nearly constant for another decade or so. (There are extensive probative citations from the medical literature on the the medical-effects page here.) That a man can, by a diligent exercise regimen, sustain, or even improve, strength after his early 30s is no puzzle or inexplicable oddity--it is normal human behavior. Though there is less work generally available on the possible effects of steroids on pitching, this extensive 2006 Amy Shipley Washington Post article titled "Do Steroids Give A Shot in the Arm? Benefits for Pitchers Are Questionable", quoting numerous baseball medical experts from Dr. Frank Jobe to Dr. Mike Marshall, strongly suggests that the current informed consensus is that steroids (and presumably other strengthening PEDs) have little or no beneficial influence on pitching performance. Though this perhaps belongs under "medical effects", I should note that some partisans, confronted with the arguments above and seeking some validation of their cherished beliefs, argue that even if PEDs don't boost power rates, they distort power counts (that is, home-run totals, seasonal and career) by helping players to heal faster from injuries, and thus to get in more playing time than they could unaided. Consideration of nothing else but the numerical fact that even the best home-run hitters produce an average of one home run every three games ought to discourage this belief, but a closer examination, as presented here on a separate page, PEDs as Healing Agents, more thoroughly dispels this folly. Again: you can--and should--read the entirety of the "effects" analyses on the Actual Baseball Effects of PEDs page of this site. But, some would say, even if we stipulate that PEDs have not, after all, influenced baseball results, surely it is right to ban them because they are so dangerous? But are PEDs dangerous? If so, how dangerous? Before we even open the books, the threshold question here is "So what?" That is, let us suppose that incontrovertible evidence demonstrated medical harms from PEDs that were both certain and serious; why would that justify banning them? That is not so trivial or obvious a question as it may seem. It is, in fact, just a specimen of the larger question of the extent to which a nominally free society may regulate personal conduct that can harm no one save the individuals engaged in it. A drunken driver is a menace to everyone on the road; a childless cigarette smoker in the privacy of his or her own home harms no other unconsenting adult. We prohibit driving while drunk, but we do not prohibit smoking in areas where only other consenting adults are present. A proposed law to make all use of cigarettes illegal and punishable is so laughably impossible that no legislator would ever even introduce a proposal for it. Indeed, that one word "tobacco" makes a mockery of all claims that the banning of PEDs by the Congress or, in this case, by Major League Baseball derives from their putative risks of harms to health: few generally available substances have the drastic and horrific proven effects on health that tobacco has, but neither MLB nor the Congress has banned--and obviously would never dare to ban--tobacco use. The distinction that most PEDs are illegal and tobacco is not is utterly immaterial if the very reason for the illegality is "health risks". And if it is not, then those putative risks should not be cited as a reason for the ban. Consider also alcohol abuse. It is illegal to drive while drunk; the offense is not trivial, and very clearly persons other than the driver will have been put at severe risk. I am not going to embarrass individuals with a roll call, but there is very certainly a long, well-known list (long by both names and time span) of both players and management staff under MLB's jurisdiction being convicted of DUI--sometimes several times over--with never any penalty whatever being imposed by MLB itself, and usually none even by the particular team in question. So grossly illegal activities, which are on the public record, that place innocent others at grave risk of harm up to and including death, are not penalized by MLB; common, openly performed activities that are scientifically proven to place the user himself at grave risk for horrible illness--cancer--possibly leading to death are not banned by MLB. But PEDs are illegal and banned in large part because such substances supposedly "pose significant health risks to those who use them." As Professor Moriarty famously remarked, "Dear me, Mr. Holmes! Dear me." With those thoughts in the backs of our minds, let us now examine those supposed "significant health risks". One of the seemingly countless flaws in almost all discussions of steroid use is a total failure to distinguish the many varieties of substance captured by that single term "steroid". While they all belong to a single family, and thus have many similarities in their effects, there are important differences between them, notably the alkylation method used in making them. The differences can be important. For instance, so-called "17-α" alkylation was an early development that allowed steroids to be effective when ingested orally; whenever different studies on a given medical topic report significantly differing results, typically such negative findings as there may be are associated with a 17-α type of steroid. It is important to keep these things in mind when one hears such phrases as "have been tied to", because the speaker or writer is usually trying to assert a generality about all steroids based on the properties (probably exaggerated at that) of one sub-class of substance. Though some steroid users are startlingly ignorant, accepting whatever someone else gives them, by and large the user community is well aware of the distinctions. Another major flaw is a lack of perspective. There is probably no substance, including common over-the-counter preparations, for which one cannot find a 1% or 2% fraction of the population having adverse reactions. (In fact, a Harris Poll found that about one-third of people taking a prescription medicine reported an adverse reaction--and that, remember, to a medication specifically prescribed for them; even in hospitals, serious adverse effects from prescribed drugs can run as high as nearly 7%.) With PEDs, as with anything one puts onto or takes into one's body, there can always be rare instances of individuals with thoroughly atypical responses, who thus might show some unusually adverse reaction to this or that PED. That is not in itself a reason for considering such substances pernicious, much less for banning them, any more than it is for, say, sulfa drugs or acetaminophen or aspirin or, for that matter, coffee--which contains the potent narcotic caffeine. A third issue is that investigations and discussions typically refer to "athletes", but in an overwhelming fraction of cases they really mean high-intensity weightlifters and bodybuilders, whose abuses of these substances typically far outdo what even professional athletes such as ballplayers may do (as evidenced by the classically freakish-looking bodies that such bodybuilders cultivate). Evidential results from "abusers" need care in evaluation: there is overuse and there is overuse, and to assume that what may be detected in gym fanatics necessarily represents what effects may occur in less rabid users is to tread thin ice indeed. Overall, the view suggested by examination of the literature is not that steroids are utterly harmless, but rather that the risks of harm they present have been--whether from simple ignorance or from what could only be called political agendas--grossly exaggerated. The various potential consequences, individually or ensemble, are not grave, are not universal, and are almost all completely reversible. Now on to the specific claims. I suppose the laundry list that Mr. Mitchell set forth will do. Here it is, with notes on each claim. Estimates in the medical literature are that steroid users developing some nontrivial (which is not the same as "serious") psychological response are 1% to 2%. Moreover--as with nearly every PED-associated effect--the symptoms disappear when use is discontinued. As already noted, there is probably no medication known to man for which 1% or 2% of the population will not show some unexpected idiosyncratic negative response. And another reminder: these numbers come from large-scale scientific studies, where usage and responses are closely and carefully monitored; they have weight, which no number of amateur anecdotal reports can match. This is simply not credible as a "problem of PEDs". [A]nabolic steroid use did not appear to cause significant vascular dysfunction . . . .
What is particularly interesting is that that publication--Hoffman and Ratamess, "Medical Issues Associated with Anabolic Steroid Use: Are They Exaggerated? ", JSSM- 2006, Vol.5, Issue 2, 182 - 193--is the very one cited by George Mitchell as the underlying source of most of his medical claims (see footnote 27, page 6). Based on these results, high-intensity strength training with and without anabolic-androgenic steroid supplementation induced alterations in the left ventricular wall motion. Broadly speaking, the consensus seems to be that there frequently are unfavorable cardiovascular effects from "supraphysiological doses" of steroids, but that the intensity of those effects is typically modest and reversible. No cysts or tumors have been reported in athletes using 17β-alkylated steroids. Here is the chief case of a differentiation, as noted above, between the 17-α class and all other types of steroid. The difference arises because this form of alkylation was developed expressly to allow orally taken steroids to have significant effects, meaning that they will withstand a first pass through the liver, the body organ that performs detoxification of the blood stream. But, owing to how they withstand that pass, they can do have some cumulative negative effect on liver function. The other types, taken intramuscularly (by injection), have minimal exposure within the liver and are not chemically designed to thwart its action, and so cause no harms. Even with the 17-α types, liver toxicity is mild, and--again--the effects totally reversible on discontinuation. (It is also worth remembering, for perspective, that if you take Tylenol for four days as directed you may be at risk of [permanent] liver damage; in other words, everyday Tylenol is a substantially more serious liver risk than any steroid. Major-League Baseball is scarcely likely to ban Tylenol use despite that known, documented risk (which is far graver than steroids). Other studies confirm unchanged libido following 10 weeks of anabolic steroid administration . . . Mind, "libido" is not the only "reproductive-system" issue: there is (in what percentage of users I am unsure) some shrinkage of the testicles. What the literature says about it is that it is not drastic, and is fully reversible. It is accompanied by reduced fertility, also reversible. Whether having lowered chances of becoming a father while using steroids is a negative or a positive will, of course, depend on individual circumstances; but none of this rises to the level of "a serious problem". As with everything said here about steroids, we need to keep in mind that we are speaking with reference to adult athletes. There is no doubt that musculoskeletal problems from steroid use are a grave risk for adolescents, whose bony plates have not yet set. But in adult athletes, this issue with the spelling-test name comes down to possible tendon tears. [A]nabolic steroids did not induce any ultrastructural collagen changes that would increase the risk of tendon ruptures . . . . It is perhaps ironic that steroids have an excellent medical reputation for use in curing torn tendons . This category can, of course, include whatever rumor one cares to throw into it. Most of what has been thrown into it--acne, excess sebaceous secretion, increased body hair, acceleration of male-pattern balding, enlargement of the prostate gland--is silly or trivial. Some mild acne can occur but is reversible; if that is a "significant health risk", we need to redefine our terms. "Sebaceous secretion" sounds horrid, but means perhaps a little extra ear wax or slightly oilier hair. Male-pattern baldness is simply a red herring, as even our by-now familiar friends Hoffman and Ratamess agree. Prostate enlargement is another flat-out lie (in fact, "High levels of testosterone and adrenal androgens are thus associated with reduced risk of aggressive prostate cancer . . ."). Curiously, the single possibly significant risk of steroid use is scarcely touched on in Mitchell and most discussions. It is gynecomastia, which means enlargement of the male breasts. It is potentially problematic because it is the sole exception to the usual pattern of symptom disappearance with discontinuation of the medication: the enlargement, if it occurs, may not go away by itself. While a "high remission rate" can be achieved by appropriate counter-medication when gynecomastia does occur, there are occasional resistant cases, which then require surgery, which is not necessarily simple, in that "the . . . tissue that builds up is extremely firm and hard and presents a difficult surgical problem". So this one can be a significant problem, though, as the literature points out, "gynecomastia may occur after the very first injection. In others, it may happen after many months of repeated use. And some users may never see as much as a single lump". And when it does occur, its earliest onset will be immediately obvious to the subject. Despite the ability of a collection of United States Senators to conclude that steroids are as poisonous as cocaine (well, consider all the other things that collections of Senators have concluded), no one else has. Most of what has been said on the subject--and it is typically not by medically knowledgeable persons--is essentially what I call the "chocolate-cake argument": if the user likes the results obtained by consuming a substance and becomes unhappy when the substance, and thus those results, are forcibly withdrawn, the subject is "addicted" to the substance. Just like chocolate cake, which is hereby proven to be an addictive substance, deserving of at least Category III on the Schedule. If you think that is silly, so is the like categorization of steroids for like reasons. In reality, "addiction" is a term with a clear medical meaning, and that meaning has to chiefly do with bodily changes whose nature requires ever-greater doses of the causative to achieve the same level of bodily reaction. That is emphatically not steroids. Every medication whatever, no matter how typically benign or harmless, carries the risk that a particular individual might be the rare person with an atypical and significantly negative reaction. The percentages of the population who may be at risk to a given atypical adverse reaction to steroids seem from the published literature quite small--roughly in line with, for example, allergy to sulfa drugs, which remain a commonly prescribed medication. Few of the alleged side effects of steroids rise to the level of significant even when reactions occur, and in all but one case (breast enlargement) can be made to disappear by simply discontinuing the steroid; even in the case of gynecomastia, when it lingers it is usually amenable to medication. Nor are these substances addictive. The bottom line seems to be clear: One, by consensus medical and jurisprudential knowledge, these substances should not be illegal; two, regardless of legal questions, their use would not be considered by any sane person to be a medical "risk"--users would routinely be monitored by medical personnel for possible onset of atypical reactions. Even in the present artificial status, in which legitimate medical personnel are precluded from participating, symptoms above the mildly annoying level are rare and almost always reversible. To present steroid use as a major medical risk--or, worse, as a sure ticket to catastrophic consequences--is to invite cynicism or worse in users and, as has been seen with so many other illegal substances, a marked tendency in the user community to disregard all cautions as lies. A much more extensive analysis of the "medical risks" claim is available on a page of its own . We need not examine the medical risks to adolescents from PED use: everyone agrees that they are substantial and potentially grave. The real question is whether PED use by professional athletes has any causative effect on their use by adolescents. We first need to note that there is scarcely some runaway epidemic of usage. Current adolescent use rates for steroids are about 1.5% (bet you didn't know that) and dropping (bet you didn't know that, either). And those results are from multiple very large-scale scientific surveys. Still, any use by kids is too much. It is a claim so often repeated--"youth model their behavior after prominent athletes"--that it is a part of folklore. Indeed, as it turns out, it largely is folklore. Comprehensive, careful, sizeable scientific studies show that not even one in five adolescents (actually, 18%) identifies an "athlete" as a role model. Moreover, it is a staggering leap of faith to go from the idea that maybe kids wear their baseball caps backwards because athletes do to the idea that they--high-schoolers, maybe even middle-schoolers--are injecting illegal, known-risky (kids do know they're risky, surveys show it), and above all very expensive medications on a continuing basis simply because they've heard some athletes do. Anyone who can believe such a proposition, call me, I've got this big bridge for sale, really cheap. In some cases, the folk who apparently do believe that proposition are parents whose kids have been injured, or perhaps even died, while (which is famously not necessarily equal to "because") they were using steroids or some other PED. I truly hate to seem harsh to bereaved people in deep pain, but grief is not a substitute for facts. To assume that this or that youngster was using, or abusing, PEDs "because major-league ball players do it" is to turn away (perhaps subconsciously, perhaps deliberately) from the vastly more probable reasons, the ones that careful scientific investigations have found--because those reasons can be painful for those close to the kids. There are three real reasons why teenagers take PEDs. Let's consider them one by one. The #1 reason for use is, both amusingly and sadly, to get big muscles to become a "babe magnet". There's very disturbing data about middle-school children, boys mainly, using anabolic steroids as part of weight lifting programs. According to one study, it's not football players for the most part, but boys who are doing it to make themselves more attractive to girls. The role models aren't athletes. The main reason offered for drug misuse was to improve their appearance . . . . These male adolescents believed girls prefer boys with big muscles . . . .
And there are plenty more where those came from (all cited on the main page here dealing with this claim). It's hard to rank the remaining reasons, but this is likely the #2. It is a consequence of our society-wide emphasis, right down to the lowest levels of schooling, that winning is not everything, it's the only thing. And it's not bad enough that the kids absorb that sick attitude with every breath they take. What is even more distressing is that it appears from the evidence that many school coaches, who have a great fiduciary responsibility to these kids, have made it clear, sometimes in a "nudge-nudge-wink-wink" way but too often expressly, that they will look away from, or even implicitly encourage, use of PEDs because "winning is everything". That is sick. But it is certainly not related to "hero worship" unless we consider those coaches "athletic heroes". Kids are under pressure from their peers, their parents and their coaches to excel, so some turn to performance enhancing drugs. That pressure to succeed is communicated to the athlete. You want to please the coach. When I had done everything my body could do naturally, it wasn't enough. I wanted to play pro football, so I went to the strength coach and I asked him about steroids. He gave me a book. He never said, "No, you don't want to do that." The kids--usually football players, but with an admixture of weight lifters and wrestlers--aren't doing PEDs because some "role model" athlete supposedly does: they're doing it in a deliberate, calculated effort to be bigger, stronger, more capable athletes at their current academic level. This category might even take in more than the one above. It includes two distinctly different but widely recognized problems: irrational body-image and clustered risk-taking. The technical term is "muscle dysmorphia". It affects boys as almost exactly the obverse of anorexia among girls: what they see when they look into a mirror is (maybe even literally, who knows) not what anyone else looking at them sees. The muscle-dysmorphic adolescent sees a weak, puny, unmasculine body no matter his actual musculature. It's not funny, it's serious--potentially deadly serious. It is a literally pathological condition. And it is probably more common than is generally recognized. This condition [muscle dysmorphia] may cause severe subjective distress, impaired social and occupational functioning, and abuse of anabolic steroids and other substances. Epidemiologic data suggest that muscle dysmorphia, though rarely recognized, may afflict substantial numbers of Americans. And though the next quotation comes from studies of adults, the condition in adolescents, who are, heaven knows, already preternaturally sensitive about their growing, maturing bodies can only be worse. The men with muscle dysmorphia differed significantly from the normal comparison weightlifters on numerous measures, including body dissatisfaction, eating attitudes, prevalence of anabolic steroid use, and lifetime prevalence of DSM-IV mood, anxiety, and eating disorders. The men with muscle dysmorphia frequently described shame, embarrassment, and impairment of social and occupational functioning in association with their condition. By contrast, normal weightlifters displayed little pathology. Another well-known psychological problem set is represented by what is often known as Jessor's problem-behavior syndrome for adolescents; stripped of jargon, it is just the well-known "problem child". The kids are those with serious personality damage--the term "emotional cripples" might not be too far off--who seem hell-bent on a self-destructive path. They engage in a whole shuddersome spectrum of high-risk activities. Based on a national sample of over 16,000 public and private high-school students (the 1997 Youth Risk Behavior Survey) . . . users had significantly greater odds of engaging in other illicit drug, alcohol, and tobacco use, fighting, suicide attempts, sexual risk-taking, vehicular risk-taking, and pathogenic weight-loss behavior, suggesting that steroid use is part of Jessor's problem-behavior syndrome for adolescents. Despite the stereotypical images of the male athlete user, both nonathlete and female users also faced elevated risks of multiple drug use and other health-compromising behavior. Thus this study rejects the view of steroid use as merely a logical extension of the male athletic cultural imperative. Adolescent AAS-use seems primarily to be another type of problem-behavior and only secondary [sic] is it associated with strength sport participation and disordered eating. -- "Use "Use of anabolic-androgenic steroids in adolescence: Winning, looking good or being bad?" Such clustered-risk behavior has various roots, which adults have been trying to sort out for probably 50,000 years or more; but that they exist and, even in the more extreme forms, are all too common, is scarcely arcane knowledge. Steroids, as they became available, were simply added into the cluster. And, of course--bottom line--none of this has anything whatsoever to do with "modelling behavior after prominent athletes". Not that many kids have an athlete as a "role model", and those that do seem actually cleaner than the others. The small percentage of users are motivated by utterly other considerations: beefing up for the girls, scoring the winning touchdown, achieving a visible masculinity that their own minds will never let them find, or just raising hell all over the place owing to some broad-effect deep-seated maladjustment. The idea that how we deal with professional ballplayers (or other adult athletes) could have anything to do with influencing kids to use or not use PEDs is puerile. A more extensive analysis of the "role-model" claim is available on a page of its own . For this, there can be no "research" or citations or any of the things supporting the other claims dealt with above. We do not at all know how many men, in the majors or the minors, may have taken or may even now be taking PEDs, much less how many of them did so reluctantly only because they felt that otherwise they could not compete fairly. Much of what needs to be thought about under this rubric really falls under the scope of the next major section of this page, the Ethical Issues of PED use. Nonetheless, we can indulge here in a bit of consideration. For a player to be coerced by the actions of others, he necessarily must feel that a large fraction--at least something close to a majority--of the men with whom he is in competition for a job are themselves assuredly using the sorts of substances he is contemplating. If there are only a few men at most (as a percentage) with whom he is in direct competition, here meaning others in the organization, then there is scarcely any need for him to try artificial augmentation just to remain in fair competition. Such a man might turn to PEDs anyway, on the ground that using them would give him a special leg up, but that is not the "coercion" we are talking about--that sort of coercion requires that the man feel that he cannot compete equally unless he tries PEDs. There is not, and, I suppose, cannot be and never will be any data on what ballplayers think others are doing: we can only make groundless guesses. That said, I personally have doubts, I might go so far as to say grave doubts, that there are very many players who each feel that most of the other men whose success might affect them adversely are using PEDs. Really I do. But each to his own taste. I should clarify the above: I mean what are considered the serious PEDs. I suppose it is common knowledge that amphetamines are popped like candy at all levels of professional baseball. Greenies have their problems, addressed briefly elsewhere here, but no one is talking about them right now--though we'd best start soon. For the rest, see the discussion below and on the separate Ethics page on this topic. In considering the rights and wrongs of PED use, we at once encounter another threshold question, one that also has received very little treatment. Exactly why is using PEDs "wrong"--which is really to ask is it wrong? The harm and coercion arguments are straightforward. They necessarily presume that human-performance enhancements create the potential for unacceptable risks of harm. It thus follows that tolerance of their use is coercive because it may force others to undertake risks they otherwise would not, merely to assure their competitive capabilities. The moral-boundary argument focuses on the boundaries of "natural" versus "unnatural" properties. These boundaries are often difficult to draw with precision and even more difficult to maintain in practice. Coherence arguments address issues of whether or not an action is consistent with our idea or understanding of the "essence" of an endeavor or phenomenon. In sport, much writing articulates what is integral to our appreciation of what it means to play games and to be engaged in athletic competition. Thus, a coherence analysis asks if drug-enhanced athletic performance is consistent with our notions of what it means to engage in sports. Normative-systemic arguments point to the moral rules which exist in a society and ask if the action or phenomenon under consideration strengthens or weakens faithfulness to those moral beliefs. Dr. Norman Fost : Dr. Fost was awarded an A.B. by Princeton, an M.D. by Yale, and an M.P.H. (Master of Public Health) by Harvard; he is not only a practicing pediatrician (and Professor of Pediatrics at the University of Wisconsin) but also a widely recognized expert in medical ethics, being Director of the Program in Medical Ethics at the University of Wisconsin (which he founded) and Chairman of the Hospital Ethics Committee; he heads the Child Protection Team, and is a former Chairman of the American Academy of Pediatrics Committee on Bioethics. Last year he received the William G. Bartholome Award for Excellence in Ethics from the American Academy of Pediatrics. Dr. Charles E. Yesalis: Dr. Yesalis was awarded a B.S. and M.P.H. by the University of Michigan, and his doctoral degree by the Johns Hopkins University School of Hygiene and Public Health. He has been a faculty member at Johns Hopkins, a member of the Department of Preventive Medicine and Environmental Health at the University of Iowa, and is currently Professor of Health Policy and Administration and Exercise and Sport Science at The Pennsylvania State University. He has testified six times before the U.S. Congress and acted as a consultant for the White House Office of National Drug Control Policy, the U.S. Senate Judiciary Committee, the National Institute on Drug Abuse, the Drug Enforcement Administration, and the Food and Drug Administration. Dr. Yesalis is the author and editor of four books on drugs in sport: The Steroids Game, Anabolic Steroids in Sport and Exercise, and Performance-Enhancing Substances in Sport and Exercise. The remarks from Dr. Yesalis--who is the verbatim source for the second of the problem-definition lists above--are taken from a book he edited and contributed to, Anabolic Steroids in Sport and Exercise, where they are glosses on the list as presented above. Good ethics starts with good facts, and the claims on this point are, to understate the case, seriously overstated. In any event, we regularly allow adults to do things that are far riskier than even the most extreme claims about steroids: the claim by the leader of the National Hockey League that they test for steroids because they're concerned about the health and safety of the players is, well, hysterical. "Coercion" is the use or threat of force, or the threat of depriving someone of something he or she is entitled to. No one in American sports is forced to use steroids. Nor is anyone entitled to be a professional athlete. It's an opportunity, often involving high risks, which everyone is free to walk away from. Every player who participates in any physical sport undergoes risk of bodily injury, and often very great risk (consider boxing or football). If people want to play those sports, they take on those risks; if they don't want to take on those risks, they don't play those sports. To make a po-face claim that in our never-ending battle for Truth, Justice, and the American Way we must do everything possible to remove as much risk of harm as possible from the game is to make milk spout from the nostrils. Checked outfield padding lately? The rules on batting helmets? To especially select performance-enhancing drugs as an element of the game that will not be allowed when they bring some benefit (which we know that for baseball they don't, but we'll assume it for the argument, because in many sports they do), unless they are more or less poisonous (that is to say, a highly probable risk of major harm), is arbitrary and silly. One might as well argue that tackling be eliminated from football, because exactly the same arguments apply pro and con. But it remains as: football, tackling; no tackling, no football. There are only so many ways to state this simple, clear, overarching truth. Sports are games, invented by humans, with arbitrary rules that are constantly changing. Since the beginning of recorded history, athletes have used an infinite variety of unnatural assists to enhance performance, from springy shoes to greasy swimsuits, bamboo poles to better bats, and endless chemicals from carb-filled diets to Gatorade drinks. Should vaulting poles be banned because they undermine the essence of the high jump? Why is there not a ban on training in high altitudes, or sleeping in a hypobaric chamber? The argument focus is "natural" versus "unnatural" properties. The thrust of the position is that PEDs should be banned because they are "unnatural" aids to performance, the implication being that sports are otherwise pristine Greek exhibitions of pure natural bodily endowments. This one is another nasal milk fountain. Do we ban eyeglasses, contact lenses, or Lasik surgery for ballplayers? Do we ban ice packs for pitchers arms? Do we ban cleats? Or, closer to target, do we ban carb loading or high-calorie diets or the Atkins plan? Can a man with a sore throat take a cough drop? Can a man with a headache take a Tylenol? Do we regulate the amount of exercise they can do? Only 10 squats a day? Maybe no exercise at all other than actual play? Well, obviously one could string this sort of foolishness out forever, but the very reason it is foolishness is that it reflects the inherent foolishness of the "unnaturalness" theory of prohibition. There is no coherent argument to support the view that enhancing performance is unfair; if it were, we would ban coaching and training. Competition can be unfair if there is unequal access to particular enhancements, but equal access can be achieved more predictably by deregulation than by prohibition. Those awake and paying attention will of course notice that the comment used here from Dr. Yesalis is the same one quoted about "unnaturalness". That is for the very good reason that the "unfairness" argument is just the "unnaturalness" argument in a different clown suit. If there is an unfairness about PED use, it is that owing to their tabu status, they are not equally available to any who might want them. Those who are willing to risk detection or opprobrium can obtain whatever advantage they may or may not confer in a given sport, while those equally interested but cowed by the regulatory and acceptability climate are denied whatever those gains might or might not be. Athletes cannot make choices on the merits as they perceive them. First, let me say that the main page here on the ethical issues is very much more extensive than these brief passages, and is laid out with a somewhat different flow of ideas; I recommend, of course, that you read all the detail pages supporting the summaries presented on this one, but perhaps most especially so in this case. There is simply no plausible case, ethical or practical, to be made for prohibiting PED use, not in law, not in sports-organization codes. The strong tendency to regulate or ban arises largely from old instincts, not reason, which makes discussion on the issues difficult, for it has been famously said that reason will never get someone out of a position that reason never got him into in the first place. Mitchell's report is a pile of mostly uncorroborated hearsay. Frankly, a fair amount of it is believable, and sure enough we've had a trickle of confirmations of the "I did it once four years ago and it was a terrible mistake" variety from Andy Pettitte and others. But most of it wouldn't get past a good newspaper editor, never mind a judge. [A] concerted set of messages aimed at influencing the opinions or behavior of large numbers of people. Instead of impartially providing information, propaganda in its most basic sense presents information in order to influence its audience. The mere 14 pages (out of 311 in the document body alone, not counting appendices and Summary) of Section II contain the entire logical underpinnings of the document and the wider concerns it embodies. If the assertions made there are to any degree in error or doubt, then the entire document--and general opinion--is in error or doubt to exactly that same degree. It thus seems obvious that we need to examine those assertions with the most painstaking care possible, else the entire superstructure reared on them is meaningless. Regrettably, that obviousness seems to have escaped almost all members of both the sports press and the general public. But it did not, it seems, escape Mr. Mitchell or the staff preparing the document, inasmuch as throughout those few pages, one can see what can only be the result of much time and careful thought expended on the precise words and phrases to be used so as to present assumptions, innuendo, hyperbole, and plain error so that they seem to be sheer, undeniable fact. That precisianist care taken with that lawyerly coloring of the presentations may not convict Mr. Mitchell and his staff on a charge of deliberately disguising the truth, but it assuredly indicts them on it. As to examining the content of those pages, both as to the assertions in them and the validity of those assertions, well, such an examination is in fact what this whole site is. Mr. Mitchell rather closely followed his obvious sources, and both at the head of this page and in the sections on ethics we have presented and dealt with the four chief assertions upon which Mr. Mitchell erected his entire superstructure of condemnation--which he achieved, as just noted, by exceedingly careful choices of wording and implication. But there was one line of questioning which, almost by accident, pointed out the report's flaws. Representative John Yarmuth . . . asked a relatively simple question. Citing a recent New York Times op-ed ["More Juice, Less Punch"] that cast some doubt on whether the players named in the Mitchell report actually enjoyed enhanced performance during the time they were allegedly using PEDs, he asked if Mitchell had found evidence that PEDs are really effective. Mitchell's reply was the one time all day that he had to dance around a bit, emphasizing that, "the subject is more complicated than a simple phrase [performance enhancement] represents" before citing unspecified evidence that PEDs worked for some unnamed individuals. One thing George Mitchell is not is a fool. He is almost surely aware that there are, in fact, no evidences whatever of any baseball benefit from steroids or any other PED, and is not so unwise as to go on record with particulars claiming they are. Vague unsourced generalities, yes; particulars, facts, no. Mandatory random testing, formally started in 2004 after the survey testing results, appears to have reduced the use of detectable steroids, but players switched to human growth hormone precisely because it is not detectable. One has to admire it. It manages, without ever saying so, to imply clearly that steroids and hGH are essentially identical in their effects and risks, despite hGH being--as even that very document later concedes--utterly ineffective as an aid to performance (and, as it does not make clear, even less of a risk overall than steroids). It also glosses over the point that the reason hGH is so hard to detect is that the body's own natural supply of it varies by huge ratios (up to 100:1) over the course of a day, meaning that the amounts taken by users are so close to natural levels as to be very hard to identify as "added". As to Mr. Mitchell's actual investigations into alleged use, I have little to say because those are evidentiary matters on which I have no more knowledge or specialized expertise than any lay reader (would that such considerations would quiet other mouths and pens). Someone who does have some expertise, however, John Dowd, the chief investigator into the Pete Rose affair, did have something to say, which you can read in the AP article "Dowd faults Mitchell for refusing to release evidence". You can find a complete list of all 112 men who have "admitted, tested positive, or have been tied to substantial accusational media reports" at Baseball's Steroid Era, along with some detail on each of the 112 (88 names from the Mitchell Report); there, 30 are listed as "Implicated", though a few of those have now made some conciliatory admission of brief experimentation. Note that the list does not distinguish those accused of or admitting to long-term heavy use from those who may have tried something once or twice. There are further links to numerous articles and posts of varying interest and utility. Because "shame on you" stories virtually write themselves, the drug scourge is one of the best things that ever happened to baseball columnists. They wake up on the side of the angels, thwack the devil, and sleep like children. . . . among journalists, even if there's no proof, even if there's no evidence, even if there's only circumstantial evidence of evidence, there's an airtight justification for a column. And see also the page further resources for other relevant articles and books. PEDs can affect, if anything, musculature, which in baseball translates to power. They do not, and cannot, do anything to improve hand-eye coordination, vision, ball judgement, timing, or any of the factors that go into hitting except actual power, the bat speed that determines the ball velocity and thus its travel distance. Examinations of the actual records of major-league baseball for over a century, with an especial focus on the last 25 or so years, those now being attributed to a "steroids era", show clearly and conclusively--by a number of independent analyses by a number of independent analysts each using a different methodology--that there simply is not any power boost needing explaining: PEDs are an "answer" lacking a pertinent question. This fact has been disguised by the analytically faulty method of counting power events instead of determining their rate of occurrence in hitting, and further confounded by changes in the baseball, notably the juicing whose effects were felt in 1994 and possibly back in 1993, when the change occurred. PED use, to whatever extent it may have existed, simply did not affect any of the performance records of major-league baseball. The various "risks" ignorantly (or deliberately) assigned to PED use are by and large specious. Any medication whatever, including commonly used over-the-counter products, always carries some small risk, even under the most careful use, that a very small percentage of users will have atypical negative reactions; the negative reactions among PED users, as recorded by numerous diligent scientific studies, are almost all in that low-probability range. Moreover, most of the effects, if they do occur, share the qualities of not being serious medical threats and of disappearing when use of the substance is stopped. The few exceptions are these. First, blood lipid ratios ("good" to "bad" cholesterol) do seem to get significantly worse. But the relevant studies have noted that the effects one might expect on the cardiorespiratory system have not shown up. Why not is conjectural, but it may be a side effect of the PED itself, or a consequence of the generally high level of cardiovascular fitness found in professional athletes. Second, gynecomastia--a swelling of the breasts--may not disappear with substance cessation; if not, it can often be reduded or, usually, eliminated with other medications; but if that, too, fails, as it can, surgery is required, and--because the swollen tissue is typically firm muscle--such surgery is not necessarily trivial. Of course, the onset of gynecomastia, which by no means all users experience, is necessarily immediately obvious to the subject. In sum, there are medical risks, but of nothing remotely like the variety or severity commonly suggested. In reality, they are unlikely, usually minor, and almost universally reversible. Adolescent use of PEDs is low, circa 1.5%, and declining. Numerous scientific studies, looking at data from thousands or tens of thousands of adolescents, show three chief reasons for PED use, none of which are in any way related to imitating professional athletes. Those reasons are, first, for boys to develop muscles, which they think makes them more attractive to girls; second, to excel at some organized school sport, mainly football but also weight-lifting and wrestling; and third because of some psychological problems preceding and in fact causing the PED use, notably "muscle dysmorphia", which is essentially "reverse anorexia", or else "Jessor's problem-behavior syndrome", a technical name for a "bad-boy" spectrum of high-risk, often anti-social behaviors that includes substance abuse, typically with multiple substances. In the psychological cases, the use is not a cause of the problems but an effect, a symptom. Indeed, adolescents by and large do not have pro-athlete role models; in one extensive study, only 18% reported an athlete as a role model--and those so reporting were, as substance abuse goes, slightly cleaner than the rest. The medico-ethical issues of PED use are well defined, and generally agreed on going back many decades. Supposedly "ethics-based" objections to PED use are seen by experts to be the results of fuzzy thinking, a systematic failure to use logic to get beyond reflex prejudices. The idea that PEDs are objectionable because of possible risks--even despite the hard fact that those risks are rather low--is a failure to consider what sports are: an attempt to accomplish some difficult physical task or tasks as best possible. If the means involve risk--for example, a ball carrier in football must be tackled to stop his progress, creating risk for both the carrier and the tackler--then that risk is simply a part of the sport. Athletes, probably from as early as ever there was athletic competition of even the crudest sort in pre-history, have sought all means that will enable them to perform better. Many of those means have involved risk, as simple physical training itself necessarily does. But the athlete who refuses to do, for example, weight training may reduce his risk of injury, but he also greatly reduces his ability to compete in his sport, and probably would be unable to continue participating in it at all. The long and short of it is playing the game means taking the risks; avoiding the risks means avoiding the game. That leads to the ancillary question of "coercion". As the ethicists all point out, no one has a "right" to play a professional sport. Would-be players are all "coerced" by each and every one of the intrinsic requirements, meaning those needful to perform as best one can. Pro athletes, including ball players, are often urged to "play through pain", and most are proud that they do so. Or, if the top performers have rigorous, even brutal, workout regimens--as so many do--does that "coerce" all other players to identically brutal workouts? Each player does what he thinks is necessary to achieve and maintain the level of performance that he finds proper. There is no logical or ethical distinction between--just for example--killer workouts and PEDs. Each is what that athlete finds appropriate or necessary. That, in turn, leads to the further issue of a playing field that is not level. At present, that is to some extent the case with PED usage. But, as the experts point out, that is exactly because PEDs are banned. The ban creates rather than removes the inequality. When performance-improvement methods are equally available to all, each can use them as he sees fit. When they are banned, only those willing to risk punishment or opprobrium have access to them. As a side issue, the banning of PEDs (or anything medical) throws a brick wall up between physician and patient. Users will not disclose their use to their physician, and are thus denied advice and assistance if they choose to use the banned substance. Meanwhile, the medical community is denied opportunities to see, record, and analyze effects that they cannot create under laboratory conditions precisely because of the ban, so accurate information on existing and possible yet-undiscovered risks (or advantages--PEDs are effective treatments for many conditions, with more being applications being discovered all the time) becomes impossible to obtain. Then there is the "unnatural" claim. That one is perhaps the silliest of the supposedly ethics-based arguments against PEDs. Today, we have "slime suits" in swimming, compound bows in archery, lifting suits in weights, fiberglass poles in pole vaulting, and on and on. Moreover, it is not just equipment: we have scientifically determined training regimens and diets and beverages, we have accepted medications from aspirin up, we have leg wraps, we have ice packs for arms--all of which directly affect the body of the athlete and none of which are "equipment". We even have permanent major improvements to nature's original, such as Lasik vision-improvement surgery. None of that, not one bit of it, is condemned or even controversial. And what part of it is "natural"? Distinctions in athletic ability are never, ever purely "natural". Certainly a 7-foot-tall man has a greater likelihood of being a successful basketball player than the average fellow, but he still has to learn the game, have certain reflexes and other skills, and work out heavily. The skills he acquires from coaching, both mental and physical, are nothing he was ever born with--they are "unnatural". So what, then? Do we raise people from infancy on desert islands with no medical care so that we can throw them as adults into an arena and see "natural" athletics? Where does the silliness end? There are two distinct "whats" to wonder about. One is the systemic response to PEDs; the other is the ballplayers who can be proved to have used PEDs. The only thing that seems to me to make sense--however difficult or seemingly impossible in the current witch-hunt mob atmosphere--is to remove PEDs from the Schedule of Controlled Substances, and make them prescription medications available for any use a doctor sees fit to prescribe them for. Along with that move must be an aggressive education program for both athletes and physicians themselves, many of whom know literally less than zero about PEDs (by which I mean that what little they think they know is mostly wrong). Athletes should be made aware of what the real risks are; right now, as the literature abundantly records, the contempt in which PED users hold the medical establishment is frightening in its intensity, a situation that arose, not surprisingly, from all the obvious lies and gross "Reefer Madness" exaggerated claims that the self-appointed do-gooders spewed over the past several years. It is essential that we restore the mutual trust and communication between physician and patient that is so sorely lacking right now. Only in that way can athletes have the benefit of sound, trustworthy information on the actual risks and possible benefits--and, more important, frequent lack of benefits--associated with PEDs. And only in that way can the medical profession--which at present cannot ethically conduct research into the effects of heavy-dosage PED use--get better data on high-dose usage of PEDs, data that as things are it has to try to deduce from dubiously reliable self-reporting by a scattering of users. The chief problem--as it always is--is that the crucial decisions are not being made by people with knowledge on the subject sitting down and considering the facts and the implications of those facts: they are being made by demagogues and irrational scare-mongers, many of whom have an obvious axe of self-interest to grind. 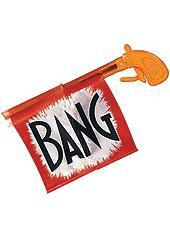 We've all seen clown guns like the item shown at the right. Now suppose someone picked up one of those, not knowing what sort of gun it really was, and with all malicious intent "fired it" at someone else. What crime has he committed? How serious a crime might it be? In baseball, that is the very case we are looking at with respect to PED users. They have been firing off their PED clown guns for--George Mitchell tells us--over a quarter of a century now, and there are still no bullet holes. So how much punishment should these clowns be in line for? I bring this up here because it is exactly an ethical issue, not really a practical one. As a practical matter, what MLB does to them is important to them as individuals, but really means nothing to the sport. Assume some heavy punishments scare off all other actual and potential users: so? The game is unchanged. We have seen that beyond the shadow of any reasonable doubt. There seems little point in "punishment" for an effect-less "crime". On the other hand, it can be argued that since these men did not realize that their PED use would be in vain, they are guilty of attempted cheating, and I guess that is so. A case can thus be made that some punishment might be appropriate even if PEDs didn't help or "taint records" or any of that nonsense. But I would suggest that two things need be kept in mind when considering possible penalties: one, societies nearly always punish attempted crimes more leniently--often very much more leniently--than crimes actually accomplished; and two, it is surely reasonable in mitigation to consider the prevalence, or at least the perceived prevalence, of use by other men. It is easy to make out a case for the criminality of so singular an act as murder, but it is a lot harder to make one out for having a drink during Prohibition. Just my thoughts. Finally, if MLB had any wit and guts at all, it would face the realities, join the legalization forces, and start a major campaign of realistic education and medical assistance. If the substances remain for the nonce illegal, then let the medical staff generally monitor and assist with players' overall health: don't ask, don't tell--but stay healthy and safe. Is there a snowball's chance in hell that anything that sane will happen? You tell me. The reader has a reasonable right to ask who prepared this web page and what are his qualifications (if any). Here are the answers. Eric Walker has been a baseball statistical analyst for 30 years. For many of those, he was a freelance baseball radio reporter; working in a two-team market, he covered a full 162 games every year. At one time he had a daily 5-minute baseball "module" syndicated to 20 National Public Radio affiliates nationwide. 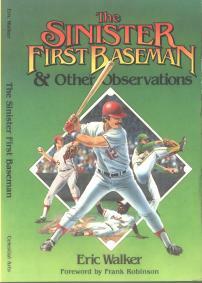 Walker is also the author of a book of baseball essays, The Sinister First Baseman and Other Observations, with foreword by Frank Robinson. In addition to reporting and writing, Walker long served as a player-personnel consultant to major-league ball clubs, most notably with Sandy Alderson and Billy Beane of the Oakland A's, as recounted in Michael Lewis's book Moneyball and at greater length in Alan Schwarz's book The Numbers Game, where he is credited with being the catalyst that initiated the moneyball-style analytic revolution at the A's. George F. Will, writing in The New York Times, referred to Walker as "the most important baseball thinker you have never heard of." Walker maintains a general-interest blog, Is it a blog yet? which often touches on baseball matters, as well as the High Boskage House Baseball Analysis web site (which is overdue for some cleanup and refurbishing). Walker has a degree in engineering from Rensselaer Polytechnic Institute; besides his baseball work, he has designed components for satellites and spacecraft, been news director at a radio station in northern Virginia, written procedural manuals for financial institutions, co-founded the "temp attorney" service industry, and done several other of the wildly various and improbable things expected of people who write. There is a separate page listing links to baseball-related pages by, about, or citing Walker. it was last modified on Monday, 26 October 2009, at 05:08 EDT.